Offering unparalleled style, quality, and efficiency, the Ultimate under deck system is the perfect way to create an outdoor living space while beautifying and increasing the value of your home. “Drying in” your deck used to mean choosing between two standard options: white and beige; but, with Ultimate Underdeck, you have your choice of two textures and ten beautiful finishes that complement the look of your home while also keeping you – and your patio furniture – dry. 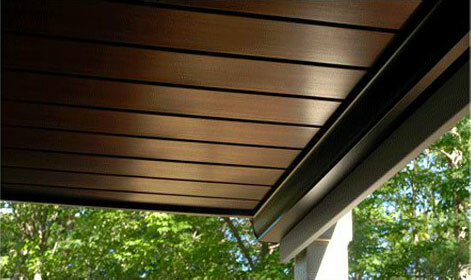 Our versatile under deck ceiling can match any style home, from a modern house in Washington to a traditional plantation home in Virginia. In addition to their outstanding beauty, the durable panels used to construct this system are made of heavy gauge alloy and can withstand decades of weathering, making them perfect for even the harshest environments. Whether you have a home on the Atlantic in Virginia or live in the mountains of Colorado, Ultimate Underdeck allows you to enjoy the beautiful outdoors and fresh air without having to worry about unexpected rain, hot summer sun, or even purchasing special outside furniture. Not sure if your deck is in good enough shape to build on? Our experienced representatives will come examine your deck and tell you if it’s structurally sound, as well as give an expected remaining lifespan. Ultimate Under Deck offers the installation flexibility to accommodate the most challenging application and finish options to harmonize with any architectural style, from traditional to contemporary. For more information on the revolutionary Ultimate Under Deck system, including how to join our expanding network of dealers, contact us today. This ceiling system is available in all 50 states. Copyright © 2017 ProMaterials Direct. All Rights Reserved. Web Design By MediaProNow.